As Reeta Skeeter goes through the capital’s dimsum selection, she does a happy dance. There’s dimsum all around and Skeeter is hungry! Mr. Choy at Khan Market has been my go-to dimsum place for a while now and I wrote about it here. And when a dimsum fest came calling, it is natural that I was gluttonously inclined. The fest is on at Pan Asian restaurant at Sheraton Hotel, Saket. 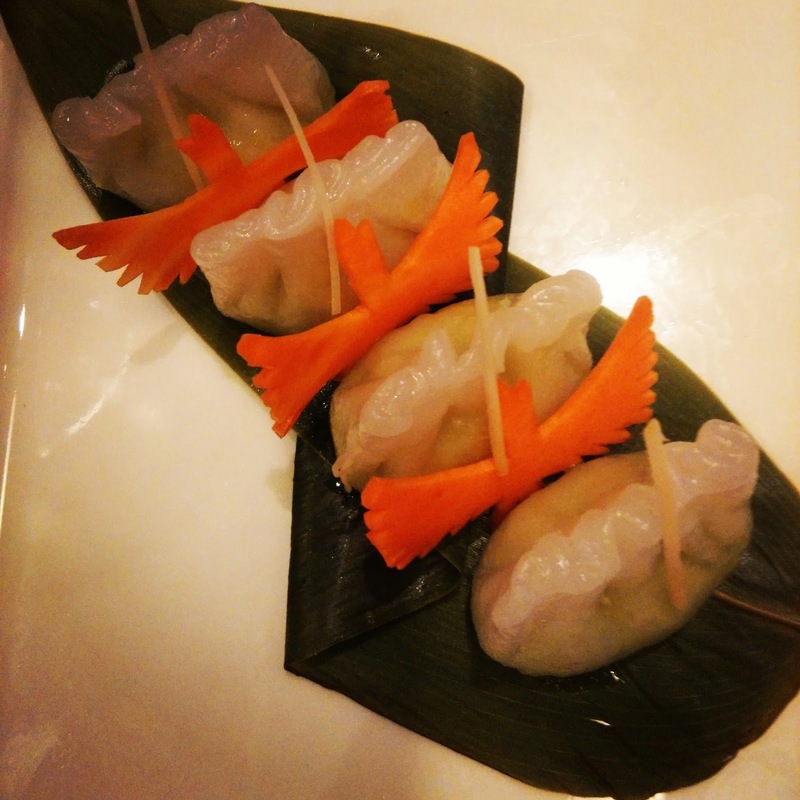 These are the categories one can choose from: Premium steamed, Teppanyaki, Gluten free, Organic, Steamed, Healthy Fitness, Pan grilled gyoza, Baked, Steamed, Poached, Soupy, Fried and Bao. The Truffle edamame (Rs 425) from the premium category was the first one Skeeter tried and it was a delicately flavoured and well-made dimsum that hit the spot. Skeeter likes her Edamame beans straight from pod to mouth but this dimsum was definitely a good pick. One could dip it in either of the five condiments: Yuzu ponzu, black bean, spicy roasted chili sauce, onion and crispy chili lime or the chilli oil. But should you want to enjoy this dimsum and othes in their own right, you wouldn’t need to touch the condiments tray. 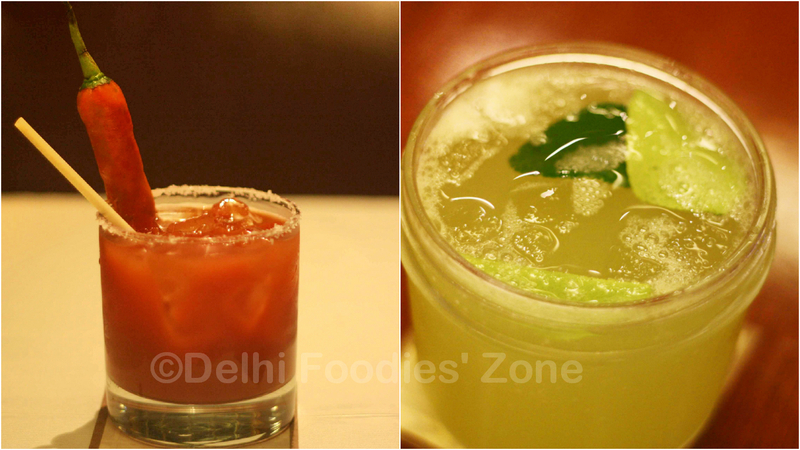 A refreshing cucumber and kaffir lime cooler went well with this food. Skeeter could have it by the bucket. An Asian Bloody Mary should be your pick if you want to spike things a bit. Skeeter tried both and cannot recommend one over the other. Moving back to the grub, the Teppanyaki pick was Asparagus and Shiitake mushroom (Rs 425), steamed then flash fried on an iron griddle. Another gem from Chef Vaibhav Bhargava, Executive Sous chef at Sheraton Hotel, this one exuded the meaty flavour and texture of shiitake that was blended with asparagus, and they made an appetising match. There is a surprise on the menu for the gluten intolerant. They can pick Rice paper stuffed with Chinese preserved vegetables (Rs 365). 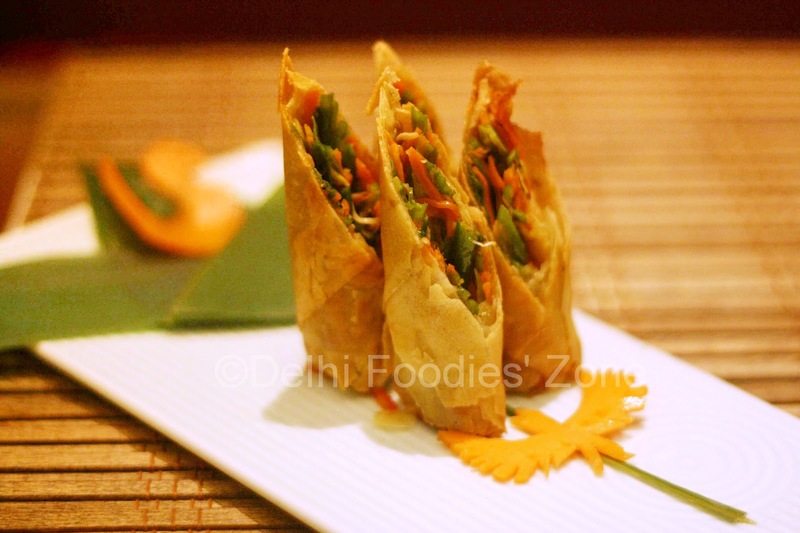 The fried dimsum with carrot and beans (Rs 325) was almost like a spring roll and is more for those who who want, well, something deep fried. I’d give it a skip the next time and head straight for the Thai spice lotus root and water chestnut bao (Rs 325). At the same price as the former, this one’s better VFM. The Thai spice lotus root and water chestnut bao is a delicately kaffir-scented, teasingly spiced and multi textured dimsum that will transport you to Bangkok in one bite. 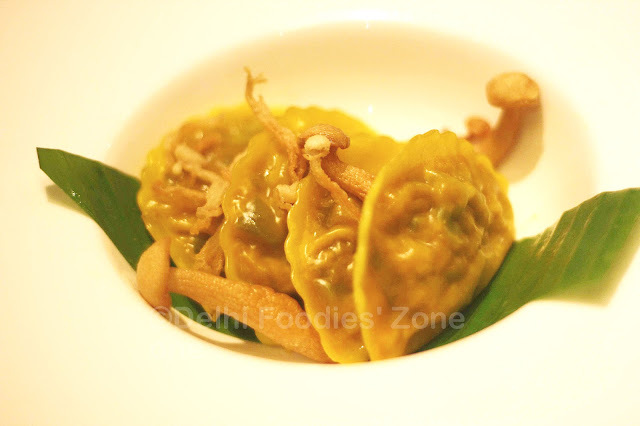 The Hot and sour soupy dimsum (Rs 325) made for some more delightful bites. They come neatly seated in soup spoons and though one should know what to expect, if you bite into half this dimsum, you’d be making a messy splash of it. Be warned! Having said that, Skeeter loves Hot n Sour soup and Pan Asian played this one well. They did a good job at controlling the temperature of the soup from kitchen to table. When Skeeter popped this one in her mouth, it didn’t scath her tongue and was warm enough to make her crave for a bowl of soup right then! Skeeter would’ve ended this post on a sweeter note but she’s saved the best for the last. 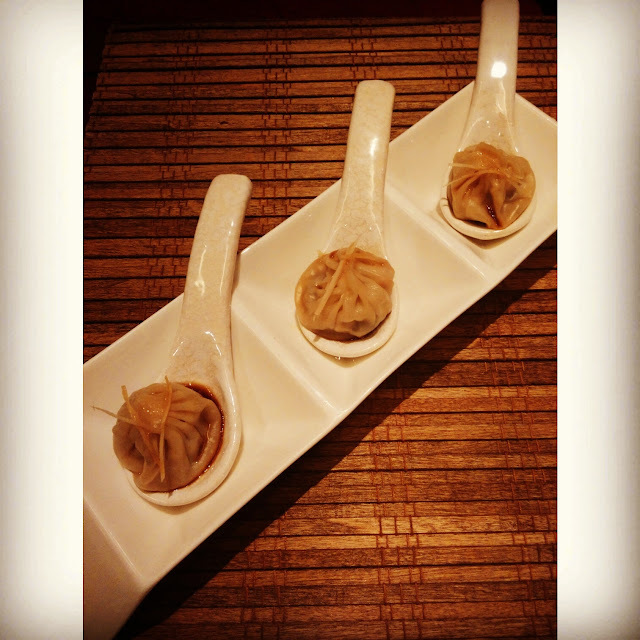 Skip dessert and end your meal with the seven treasure mushroom dumpling. This one comes seated in a deep dish and since Skeeter is a fungi fanatic, she was in for a treat. These amazingly textured dumplings come in a thin yellow wrapper stuffed with shredded Enoki, Shiitake, Black fungus, white fungus, Shimeji, button and string mushrooms. Besides, the presentation is beautiful as they come plated with some crispy mushrooms on top, a double treat! You dig your teeth into the soft, steamed dumpling and then you bite on some crispy mushroom. If you’ve made it to the end of this post, you have to order this one to believe what I just wrote. Chao! The festival is on from 10th to 31st August.